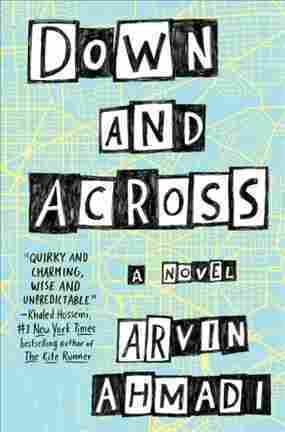 A Puzzled Teen Seeks Answers And Finds Crosswords In 'Down And Across' Author Arvin Ahmadi's debut novel follows Scott Ferdowsi, a disenchanted Iranian-American high school student who runs away to Washington, D.C. to find an expert on the psychology of success. In Arvin Ahmadi's debut novel Down And Across, 16-year-old Scott Ferdowsi hasn't quite figured out what he wants to do with his life. That worries his Iranian-American parents, who believe their son lacks grit and doesn't take advantage of the opportunities they work hard to give him. "He's tried every club at school, switches his future path every five seconds, [and] he can't quite nail down what that future path will look like," Ahmadi says. Hoping to find his purpose in life, Scott quits his perfectly good summer internship and hightails it to Washington, D.C., a city of ambitious young people working as bartenders and crossword-puzzle writers on their way to becoming lobbyists and legislators. His parents are tricky because the opening chapter, the opening scene, is an argument between Scott and his dad, you know, who he finds to be overbearing. And his dad is trying to compromise. And Scott, of course, takes that little bit of compromise that his parents are leaving him home alone for a few weeks, and he abuses it. He runs away from home, and I think that's the struggle with his parents, that they're trying. And even as a teenager, you know, maybe you hate your parents, maybe you're just constantly irked by them, but I think when you grow up or even when you really think about it, you realize that they're trying and they want the best for you. This story is very autobiographical. I mean, it was inspired when I saw a real-life TED Talk by a real-life professor, Angela Duckworth, about grit. And it inspired me, and it terrified me, and so I created this fictional version of her and had Scott run away to meet her. When I first started writing this story, it was inspired partly by that grit TED Talk but also by a couple of my failures. And so when I first started writing Down and Across, Scott was Jack, and he was not Iranian. And then I, you know, eventually I made him half-Indian, half-white so that I could inject some of my experiences in there, the son of immigrants. And, you know, finally I decided, "Screw it, I'm going to make this an authentic story about my experiences growing up and struggling with failure and my future path." Deep down, I constantly had impostor syndrome. I think it was this constant self-doubt and just uncertainty about my future, and I think we're seeing more stories like that in a lot of different mediums, how on the surface a person may appear one way but underneath the surface they are a lot more complicated, and there's this self-doubt. ... It's not a story that we [see] very much among diverse folks, among marginalized folks, among women, among people of color, [and] people from different sexualities. So I think we're getting those classic stories now but re-purposed in a diverse sense. Because I was a dramatic teenager, I escaped through the window and left it open, so they knew I had run away. But now, I admire Scott's tenacity and I think it's a lesson for us all that we're shaped by our experiences and that we should be willing to take risks — maybe not necessarily running away, especially as teenagers, but [to] do things outside of our comfort zone. I think they're all colorful characters at their core. It was important for me to represent not just diversity of skin color or culture but a diversity of interests and backgrounds. And, you know, I think that's what Fiora and Trent, who are the two main supporting characters, that's what they represent. Trent is this gay, Southern, libertarian bartender/aspiring politician, and Fiora is a girl with a sort of dark past who writes crossword puzzles. And to me, they're very real characters because they represent the ways in which people are different, even if they look like everybody else. Sophia Schmidt and Martha Ann Overland produced and edited this interview for broadcast. Sydnee Monday and Patrick Jarrenwattananon adapted it for the Web.